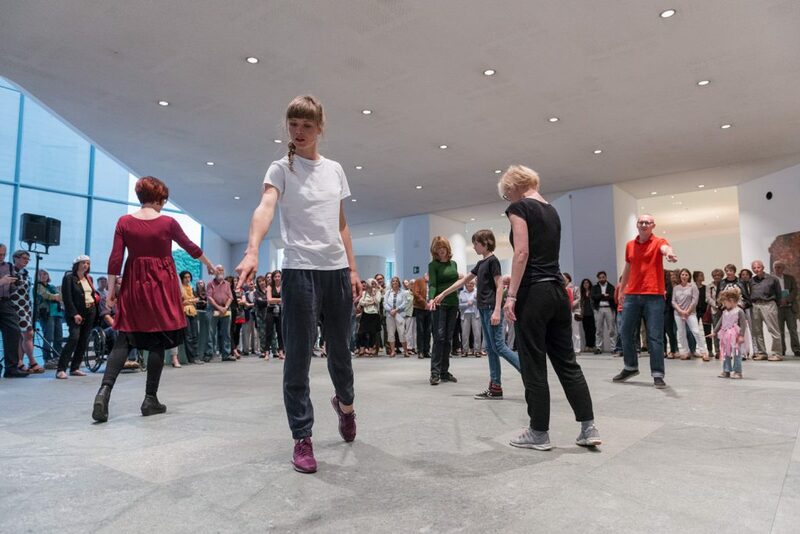 Rond de Jambe, live performance as part of the Dorothea von Stetten Award, Kunstmuseum Bonn, 2016. Rond de Jambe is a series formed by two works: a 3-channel video installation and a live performance. Each work of the same project approach the same subject matter through a different medium in order to investigate politics as they are made manifest in and through the body. Using archival footage of protests of the Stopera building project in Amsterdam as a starting point, Aimée Zito Lema worked with dancers to translate the protest movements into a choreography. The Stopera Building was built between 1979 and 1986 to house both the city hall of Amsterdam and the Dutch National Opera and Ballet. The building project was met with heavy protests from local left-wing groups who argued that the space should be used for social purposes and housing, rather than those that only serve an elite or privileged class. The opposition claimed that it had been planned without any historical and social awareness, ignoring the traumatic history of the area marked by WWII. This work is indicative of Zito Lema’s practice, and her interest in the way in which the history of socio-political events are documented, recalled through representation, and activated through new juxtapositions and material form.